The Michael by Michael Kors Logo Metallic Tote is an embossed tote available in metallic gold or rose gold. Both versions have hardware to match the colour of the bag and feature the MK logo circle handbag charm. The totes have two top handles with buckles to adjust the length of them. Each bag has a top magnetic fastening and inside there is a pouch pocket and a zip pocket. The bags have a golden lining. Grab yourself some up town chic with this adorable Michael by Michael Kors metallic tote. I love the mirror finish, it is so eye catching, and this bag is perfect for use on or off duty – it’s rectangular shape is great for carrying magazines or work documents. This Tory Burch logo clutch is made from leather and has a golden Tory Burch logo inset in the middle. This clutch is a flapover style bag, with a stud fastening, and it has a golden chain shoulder strap with a black leather shoulder rest. This strap is detachable for two different looks. 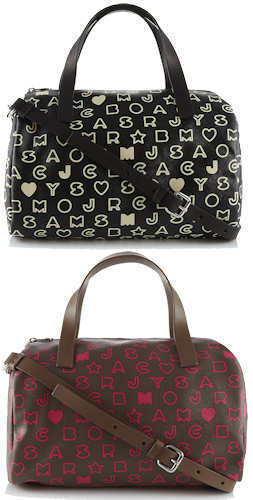 The bag is fully lined in signature fabric and has two zip pockets, one under the flapover and one inside the bag. It also has a convenient handbag mirror which is lined in black leather and embossed with a metal Tory Burch logo. Measurements: Width 11″ / 29cm; height 6″ / 16cm; depth 1″ / 2cm; handle drop 19″ / 47cm; all measurements are approximate. Style note: This is an elegant evening clutch and would be fab to use for meals out and evening frolics with friends. The golden chain is sumptuous and the brand logo is prominent yet classy. You could team this bag successfully with a range of outfits, including chic jeans to little dresses, black or otherwise! And of course, the removable strap means that you can carry it as a clutch or wear it over your shoulder. This Tory Burch gold metallic logo clutch is made from leather and has the Tory Burch logo in gold inset at the centre. This clutch is a flapover style, and has a chunky chain shoulder strap with a leather shoulder rest. This strap is removable. The bag is fully lined and there is a zip pocket underneath the flapover and a further zip pocket inside the bag, There is also a leather lined handbag mirror which is embossed with the metal Tory Burch logo. Style note: This is such a glamorous bag for a night out, and it will add a metallic glint to your Little Black Dress and add a splash of opulence to a cocktail frock. Complete the look with gold metallic heels and gold jewellery for an expensive looking and alluring ensemble. This Fendi leather clutch is made from brown leather which is embossed all over with letters that make up “Fendi”. All the hardware on the bag is gold in colour, including the logo on the front of the bag and the chain strap. 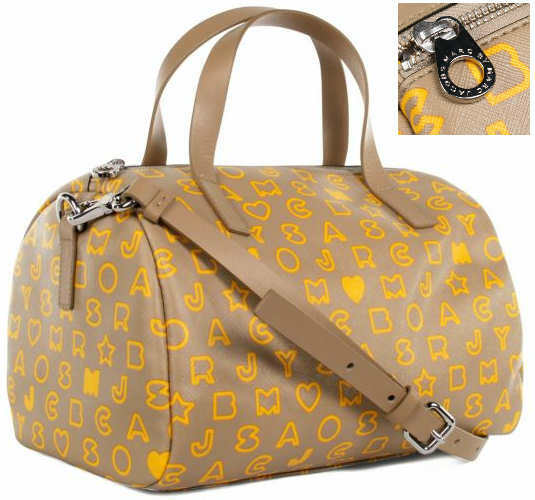 The bag is of a flapover style and secures with a magnetic fastener. Inside the bag, there is space for seven credit cards and also a pocket for notes. The bag is also lined in leather. Measurements: 19cm (width) x 11cm (height) x 3cm (depth); (all measurements are approximate). Style note: A stylish a extremely well made clutch, due to the design no separate purse is needed, so it’s the ideal bag for the party season or an evening out. Now out of stock. Click here to view this season’s Fendi bags. The Marc by Marc Jacobs Dreamy Logo Pocket Pouchette in burnt orange is a gorgeous little bag, featuring embossed leather and the most beautiful strap with alternating leather and chain links. The bag is lined in a printed material. This is definitely the little cross body bag of the season. Style note: Sling this bag across your body and head downtown for a glittering night out, with style, panache and finesse! UK based, delivery to most countries worldwide including US, Canada, EU, Japan, Middle East, Taiwan, Korea, Russia, Australia and New Zealand.